The Residential Services Program provides each young man at Ocean Tides with the structure and support they need for the activities of daily living, as well as mentoring and guidance in developing positive and appropriate peer and adult/authority figure relationships. Opportunities to learn and participate in recreational and enrichment activities are also provided, along with supports provided by nursing and health care providers. Each young man is greeted and assigned his room. Rooms at Ocean Tides are single rooms (no roommates). He receives a basket with fresh/new bedding, towels and other supplies. He receives a basic orientation to the program. After time to settle in he joins the activities of the day and begins to meet new residents, all of whom know what it is like to be new. Each new resident will meet with the Director of Social Services for an intake interview and be assigned a residential counselor and residential senior staff member mentor. The nurse will meet with each new young man to review immunization and complete or verify health history information Ocean Tides has received. On the first day of school a young man will meet with the school principal to talk about where things are at with relationship to academic achievement and needs, review any records Ocean Tides has received and develop a class schedule to maximize academic progress in school. The Program Coordinator will meet a new young man and assist him with any needed orientation questions and needs. He will also be welcomed to an intake group if more than one youth has been recently admitted. The Residential Care program happens in the context of the typical day at Ocean Tides. Young men report to the Chapel for the start of school meeting at 9:30pm and being the school day, following their individual schedules after that meeting. During the school day residents, may be called from classes for residential counselor appointments, special counseling meetings, medical care, meetings with their probation officer or other arranged and approved activities that support their care and treatment. At 3:30pm residents return to the Residential Program TV room and transition from school back into the residential program. At that time the schedule of activities for the afternoon/evening is reviewed, youth are individually remined of homework or other work requirements that need attention because of the school day, as well as receive complement for good work done during the school day. Following the meeting, young men have a few minutes to change out of school dress code and begin to enjoy the afternoon activities. Activities end to be at dinner at 6:15pm in the Student Dining Room. Following dinner there is an evening activities schedule of planned activities that will occasionally include some classes, groups or enrichment programs, as well as an opportunity to resolve issues related to not meeting expectations during the day. At 9pm young men report to their room. Lights out is at 10:30pm. A Registered Nurse oversees the provision of all health care needs of each young man at Ocean Tides. She works closely with Ocean Tides health care providers at Coastal Medical, various dentists and other specialists to assure quality, coordinated care. She is also the conduit between the any family members and Ocean Tides for information about health care, or to discuss any health-related concerns. Anchored by Ocean Tides renowned culinary arts program, young men are involved in the preparation, serving and enjoyment of high quality and plentiful food, often made from scratch in the Ocean Tides kitchens. Food service also provides interested young men with the opportunity for on campus work in food preparation and service as well as supporting those activities. All care at Ocean Tides occurs within the context of Christian Brother Center, where Ocean tides is located. Christian Brother Center, in a retirement community for 20 or so De La Salle Christian Brothers as well as home for those Brothers and Lasallians directly involved in ministry at Ocean Tides. The young men of Ocean Tides are welcomed into the Brothers Home. The Brothers appreciate their assistance and service in their dining room, enjoy having the boys enjoy dinner with them to celebrate their birthdays, have holiday meals together and enjoy casual interactions around the center that everyone calls home. 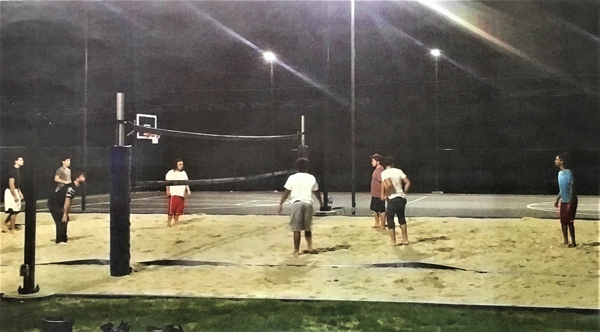 Ocean Tides’ 40th Anniversary Celebration gave us the opportunity, thanks to the support of our friends and donors, to create an outdoor recreation area next to the OT dorms that includes a full-size basketball court, a sand volleyball court, and a BBQ area. All of which are lite to allow for day or evening enjoyment.